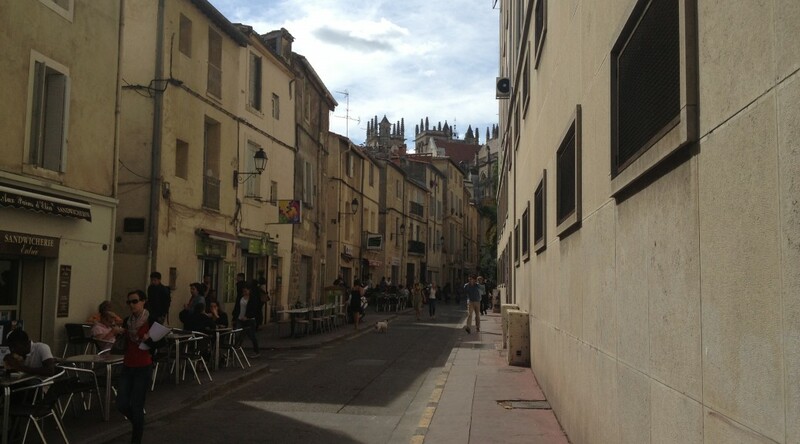 Currently I am on sabbatical in France, hosted in the lab of Michel Raymond at the University of Montpellier-2. I have been working on papers on chimpanzees and aggression, but also trying to learn French, which has me thinking a lot about language, including the evolution of language, and parallels between biological evolution and linguistic evolution. I didn’t study French in school, apart from a few weeks in grad school, but over the years have tried, in fits and starts, to learn the language on my own. I have studied two evolutionary cousins of French, Spanish and Italian, which both helps and hurts. There are lots of similarities in the vocabulary and grammar of these languages, but my wife complains that I speak French like a Spaniard. 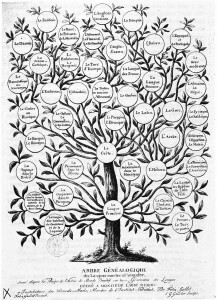 Languages are like biological species, in that they change over time, and are related to other languages in a tree-like pattern. 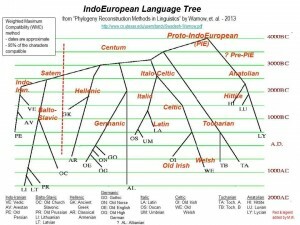 Just like humans and chimpanzees share a common ancestor that lived around 6 million years ago, French and English share a common Indo-European ancestor that was spoken something like five or six thousand years ago, before the Italic and Germanic branches of Indo-European diverged. Words are a bit like genes, in that they are units of inheritance. A language is made up of words, much like a genome is made up of genes. Like genes, words change gradually over time, in their meaning and pronunciation. With written languages, we can track these changes with spelling, just as we can track genetic changes with differences in the letters of the genetic alphabet of base pairs (A, T, G and C). Like our genes, we usually get our language from our parents. But unlike genes, we can also get bits and pieces of language, and even entire languages, from people who are completely unrelated to us. Unlike animal species (but like some organisms, like bacteria), languages can “mate” freely and exchange words. Thus, English and French have been exchanging words freely over the past thousand years, even though they are from different branches of the Indo-European language family. One of the fascinating (and sometimes frustrating!) things about French is this long history of interaction with English. After the French-speaking Normans invaded England in 1066, French enjoyed several hundred years as the primary language of the ruling class in England, and English borrowed many thousands of words from French. As a result, written French looks a bit more like English than other Romance languages do; and written English looks rather more like a Romance language than other Germanic languages do. And ever since the Norman invasion, English and French have been trading words back and forth. Like genes, words accumulate tiny changes over time. Over long periods of time, words with a shared ancestry can drift apart and become very different in spelling, pronunciation, and/or meaning. Just like in biological evolution, when populations are separated, they gradually begin to accumulate differences and diverge. Just like these changes can lead to the formation of distinct species, they can lead to the formation of distinct languages. Over time, these repeated branchings from common ancestors lead to tree-like patterns for both languages and species. 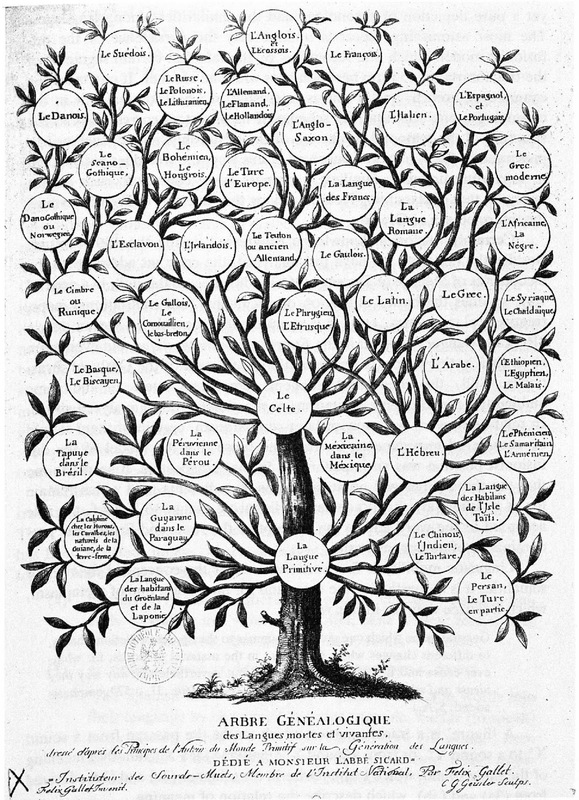 Historical linguists were the first to appreciate this, for example in this very early depiction of language evolution, which appeared about 60 years before Darwin published an evolutionary tree as the only figure in his Origin of Species. Just like in biological speciation, the process is gradual and boundaries are often fuzzy. American English is a bit different from British English. French people tell me they need subtitles to understand French movies from Quebec. Many words are spelled pretty much the same in both French and English, especially anything ending in –tion (nation, séduction, production) or –ism(e) (capitalisme, socialisme). These are often words that were recently invented and borrowed. Older borrowings, which have had more time to evolve, can look quite different. For example, castle and château both come from the Latin common ancestor, “castellum.” The English word is still pretty similar to the Old North French word “castel,” while in French, the hard “c” has turned to a soft “ch” sound and the “s” has disappeared, signaled only by a sort of fossil of an accent mark, the circumflex (ˆ) on the “a,” which shows there used to be an “s” there. French has borrowed lots of words from English, which are sometimes obvious (le sandwich, le weekend, le cocktail) but not always: le foot (football), le pull (pullover, sweater). But sometimes this is because the French word has continued to evolve in its own course, or been abandoned altogether for another word. Like dandelion. English borrowed this from the French phrase, dent-de-lion, “lion’s tooth,” a lovely name that must refer to the toothy looking leaves. 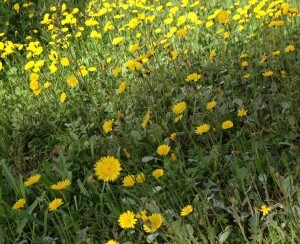 But apparently, the French don’t call dandelions “dent-de-lions” anymore. 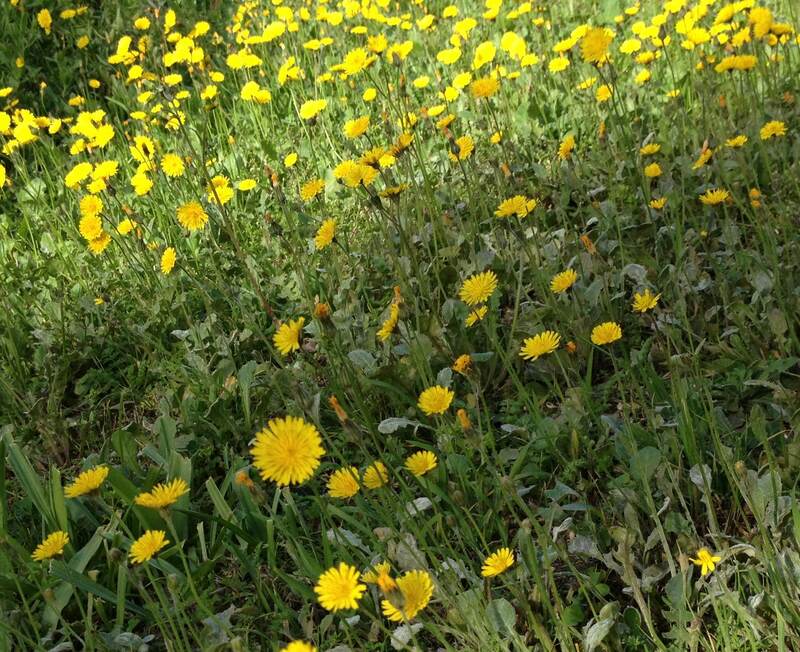 Instead, they call them pissenlit – literally, piss-in-bed, because of the plant’s diuretic properties.